Demand for mobile data continues to grow, and Long Term Evolution (LTE) technology is enabling carriers to meet that demand. LTE is the world's fastest-growing mobile networking technology, with more than 400 commercial LTE networks launched since 2010, when deployment really started. There are now 677 operators investing in LTE in 181 countries, and more than 750 million LTE subscriptions worldwide. More than 80 operators have already upgraded networks to support LTE-Advanced (LTE-A), providing download speeds of up to 450 Mbit/s. The performance of mobile phones continues to develop with application processors that integrate up to 10 64-bit cores and graphics processors that rival the performance of some personal computers. The widespread availability of 4G services using LTE is already changing consumer behavior. The combination of low latency data transfer and data rates that can compete with wired broadband and WiFi has encouraged the use of smartphones and tablets connected though LTE as the default device for accessing the Internet, cloud services and video on demand. This in turn is driving greater mobile data demand. Carriers are investing in LTE infrastructure; upgrading and augmenting macro base stations, introducing LTE services to new markets, and deploying large numbers of small base stations that expand coverage in dense areas, sparsely populated areas and in both enterprise and residential buildings. These latest base stations add new capabilities including HD voice using voice over LTE (VoLTE) and broadcast services. Carriers are also looking at ways to increase service revenue by using their LTE infrastructure for the Internet of Things (IoT)/machine-to-machine (M2M) services supporting wearable devices, smart metering, automotive, logistics and smart cities. The shift to a virtual telecom infrastructure using SDN, NFV and cloud RAN presents new opportunities for carriers to offer new services and reduce operating costs. Semiconductor components are critical to the successful delivery of these services using LTE. There are highly integrated system-on-a-chip (SoC) devices that implement the key functions for small and macro base stations with up to 3,600 active users, and highly optimized SoC devices for smartphones, tablets and IoT/M2M applications. These flexible devices support a complex mix of frequency bands, networks, bandwidths and performance. Vendors need to invest in continuous development cycles to deliver cost-effective and power-efficient solutions that scale to support more users and greater bandwidth as carriers and users move to LTE-A services. The latest LTE SoC devices for smartphones and tablets integrate multimode LTE-A modems and 64-bit quad-, octal- or hex-core processors. These developments have enabled new classes of premium, mid-range and low cost smartphones with eye-catching performance and seamless connectivity across LTE and 3G networks. There is also a place for discrete modems and application processors in high-end smartphones and tablets. The latest devices are extending support for global roaming and further increasing network bandwidths with carrier aggregation. The global LTE semiconductor market is very competitive, with multiple vendors developing application processors, baseband and radio frequency (RF) devices for both base stations and user equipment. The rapid pace of development for LTE has fueled significant vendor consolidation, with market leaders acquiring smaller companies to combine complementary 3G, LTE and application processor technology and several key players exiting the market. There have been significant changes to the market over the last 12 months, with three vendors exiting and most vendors introducing new devices. LTE Base Station, Handset & IoT/M2M Components 2015: A Competitive Analysis identifies and analyzes the full spectrum of vendors developing LTE and LTE-A components for base stations and user devices including IoT/M2M. It includes not only granular information on the components themselves – of interest to system OEMs, smartphone developers and service providers – but also insights into how the overall market and ecosystem is developing – of interest to a wide audience, including investors. 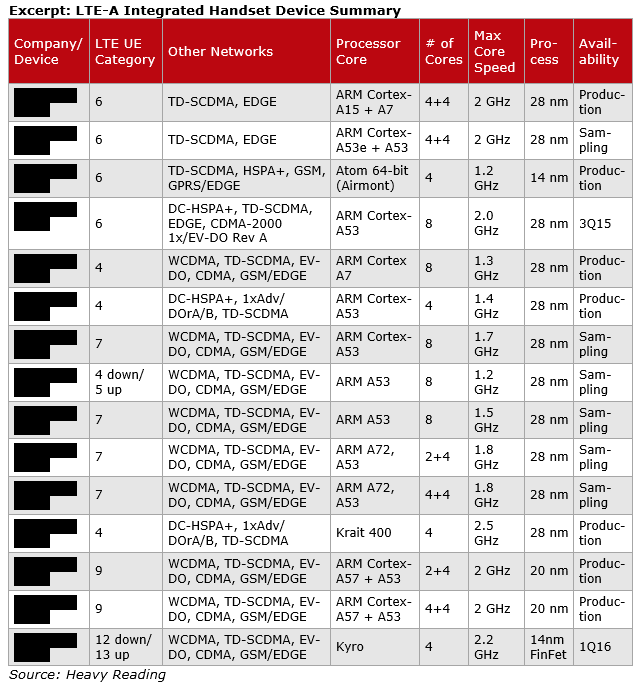 This report is based on a series of interviews conducted with a wide range of LTE silicon vendors during July 2015, along with product information supplied by vendors. The tables presented throughout the report are based on product documentation and supplemental data from our interviews and email exchanges. All of the data in these product tables has been provided to vendors for confirmation, feedback and updating ahead of publication. In total, the report contains detailed information and analysis on 133 products, including 34 LTE base station devices, PHY devices and/or MAC and control devices; 73 baseband devices and application processors for LTE and LTE-A user devices; and 26 RF devices for LTE. The excerpt below summarizes integrated multimode handset devices that support LTE-A. The latest devices integrate a Cat 6-9 LTE multimode modem supporting 2x20 MHz carrier aggregation and a 64-bit quad, hex or octal core application processor and are implemented in 14 nm, 20 nm or 28 nm technology. Most devices integrate four or eight 64-bit ARM Cortex-A53 processor cores; some also integrate two or four higher-performance Cortex-A72 or Cortex-A57 processor cores using the ARM big.LITTLE architecture. LTE Base Station, Handset & IoT/M2M Components: A Competitive Analysis is published in PDF format.